I saw Filipino painter Bernard Vista recently, when I attended the September 2009 Turumba Festival in Pakil, Laguna. 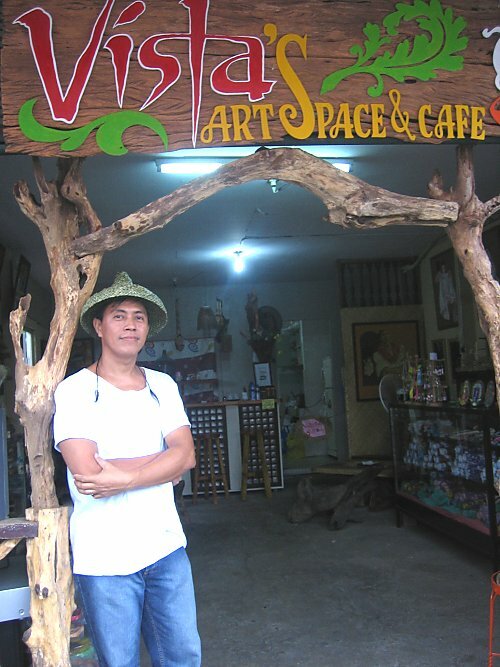 I was pleasantly surprised to find out that kuya Bernard opened a coffee shop called Vista’s Art Space and Cafe. BERNARD VISTA was born Pakil, Laguna, and went to the University of Santo Tomas for a degree in Fine Arts.It was in college where he associated with other dynamic artists from Laguna, such as Edwin Tres Reyes and Bayani Ray Acala, also from Pakil.A scholar of the Saturday Group Painters Association, he was also a university varsity swimmer throughout college, thus subsidizing his studies at the Pontifical University. Vista found work as illustrator for children’s books, honing a style that best suited the needs of the various publications.For his achievement, he won the PBBY Illustrators Prize, third prize in the national competition. Vista has actively participated in many group shows particularly those organized by Galerie Joaquin.His first major solo exhibition September of last year entitled “Biyaya (Blessings)” marked his entry in the lime light of arts as he gained recognition for his larger than life depictions of the Filipino way of life. 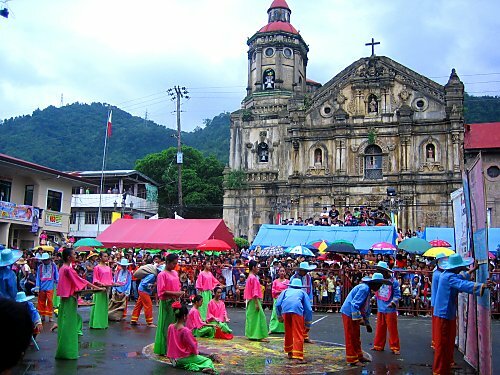 Vista highlighted the rich customs and traditions of Filipinos passed on from one generation to the next.Inspired by the rural scenes of his hometown, he puts on canvas the humble countenance of his people, human figures of fisher folks and farmers, characteristic of their passion for life and oneness with the bounties of nature. His portrayals of men and women possess a glimmer of indescribable peace, contentment, and strength of inner spirit while the activities and details by which his subjects are immortalized solidify the Filipinos’ sense of enjoyment and admirable trait of counting their blessings. I took a photo of kuya Bernard as he stood outside his art and coffee shop. There was a slight drizzle, that’s why he was wearing a unique salakot. I’m trying to build my own house, and I would like to order a painting from Bernard Vista, to be placed in the living room wall. He asked me things like what my favorite colors are, what theme I’m interested in, and what images I would like featured. This is the basic interview he conducts when customers would like made-to-order paintings. In other words, kuya Bernard is an artist who strives to get to know you better, so that he can inject his creativity and your personality into a painting specially made just for you. If you’re interested in the uniquely beautiful art of Bernard Vista, do drop by his art shop in Pakil, Laguna today. How much now is a Bernard Vista painting , size 60″ x 40″ app. ?